As I’m struggling with letting go of summer, my palate can’t help but navigate toward all things fall. 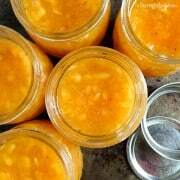 I’ve been seeking out recipes using apples, pumpkins, and…(gasp! )…my stove! 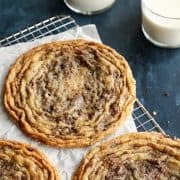 Because we grill all year long, even here in the Minnesota Tundra, our oven doesn’t get used much during the summer, except for baking sweets. As the weather cools down, the roasting pans, soup pots, and my favorite Le Creuset French Oven begin to make regular appearances. Last week I was helping our youngest daughter make a bowl of cinnamon apple oatmeal for breakfast. Yes, it was 90 degrees out, but I couldn’t help my desire to bake something with those flavors of fall. It was almost September, after all! 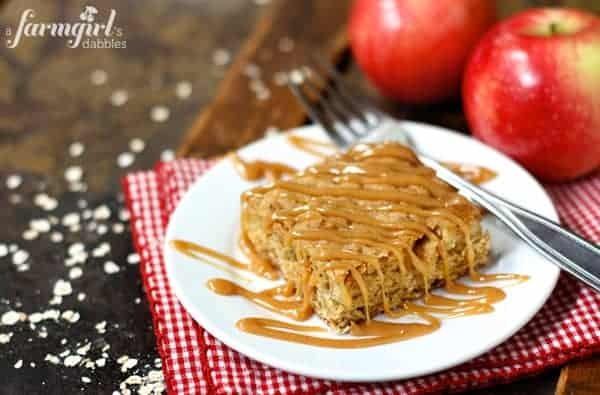 This recipe for Apple Oatmeal Bars with Cinnamon Caramel Sauce is basically a blondie with oatmeal and apples added to it, all moist and yummy. It’s then taken a step further with a generous drizzle of the most delicious caramel sauce, flecked with the warmth of cinnamon. The caramel sauce recipe started out with my favorite caramel apple dip. And then I jazzed it up a bit for these bars. Now this is my favorite apple dip! 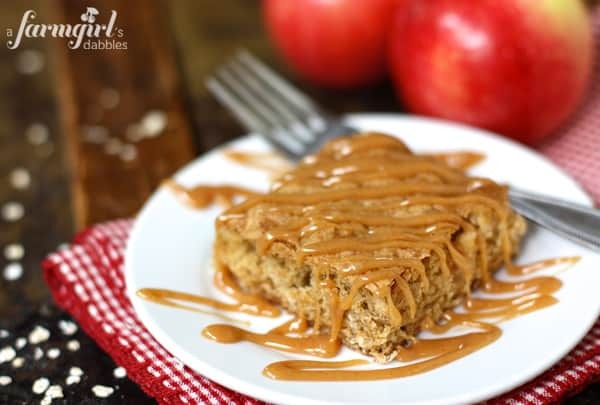 I just love that this recipe does double duty…apple oatmeal bars with an incredible caramel sauce AND enough caramel for dipping all the beautiful fall apples that are beginning to appear. Truly, a win-win situation. Preheat oven to 350°. Lightly spray 9”x13” pan with cooking spray and set aside. In a large bowl, whisk together the melted butter and sugar. Add eggs and vanilla and whisk again. In a medium bowl, whisk together flour, oats, baking powder, cinnamon, salt, and baking soda. Add dry mixture to the wet mixture and stir together. Fold in the apples and then pour batter into prepared pan, pushing the batter into the corners and spreading evenly. Bake for 25 to 30 minutes, or until a toothpick comes out clean. Remove to a wire rack to cool completely. In a medium pan over medium heat, combine caramels, sweetened condensed milk, butter, and salt. Stir occasionally until completely melted. Stir in cinnamon and vanilla. Let cool. This yields about 3 cups of caramel. Reserve about 1 cup of caramel for the apple oatmeal bars. Serve the remaining caramel with apples for dipping, warmed or at room temperature. To get the look of the bars in my photos, first cut the bars and place individual portions on plates. Drizzle with caramel. It works best if the caramel is just barely warm. Otherwise, simply drizzle caramel over cooled bars. Let set, and then cut. I just wanted to let you know that I linked over to you on my blog today. This apple cake was pretty much life-changing at our house! Don’t be surprised if you hear from me on another What’s Cooking Wednesday…because you are a frequent-flyer recipe source in our kitchen! These are just lovely! 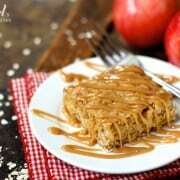 Love apples and oatmeal together! Just made these bars but with a cinnamon/powder sugar glaze instead of caramel. (That sounds delicious but had to use what I had on hand!) Fresh out of the oven with a glass of cold milk. Mmmmmmmmmm…….. 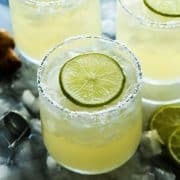 Very nice website, will be back to try some more of your recipes, especially the Cowboy Salsa. Thank you! Oh my, that ‘improved’ caramel sauce sounds so yummy. Will be trying this recipe for sure. Oh that sauce has me drooling!! 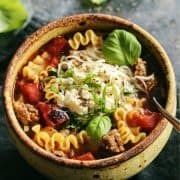 I’m SO ready for fall food!! the only reason I’m ok with summer ending is because my craving for fall flavors is so stinken insane! Bring on anything apple, cinnamon and caramel,. yes please! These look GREAT! I’m completely with you, Julia. The flavors of fall are completely yummy, and something to always look forward to. So nice to hear from you, thanks! Brenda! These looks so good! PINNED! oh my goodness, this cinnamon caramel sauce looks so delicious. And perfect with apple oatmeal bars too. 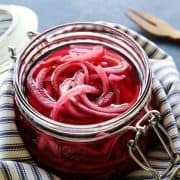 I’d be ridiculously happy to have a bite of this! 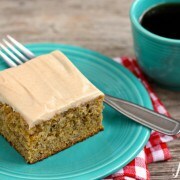 yep it’s official I’m ready for the HOT weather to take a break so I can start making some of these yummy Fall recipes! YUM, cinnamon caramel sauce sounds wonderful! 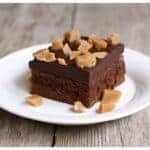 Wow, these bars sound so moist and delicious and that caramel dip itself, yum! These bars have fall written all over them! I want! I want this in my face! I’m drooling! The bars themselves look scrumptious enough but that cinnamon caramel sauce must take them over the top of the delicious mark! What a lovely Fall treat. You are so right, Paula. That cinnamon caramel sauce is crazy good!!! Oh wow! I love caramel with apples! I made some apple bars last week, but used a powdered sugar glaze on my bars. And my bars did not have any oatmeal in them either. But after reading your recipe, I think yours sounds better! We loved the ones I made a lot, so we are REALLY going to love yours I bet! We have a few orchards nearby that do the same thing. It’s impossible to leave without eating a fresh warm apple donut!!! I’m so ready for fall and there is absolutely nothing better than caramel to usher it right on in! These bars make me excited for fall! Oh. My. Word. It’s like taking a bite out of fall! Yes, so good. Bring it on! 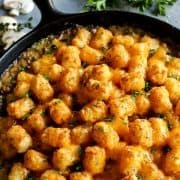 Delicious and perfect for fall! These bars look fabulous, Brenda! I love the cinnamon caramel sauce! Looks like the perfect way to kick off fall! Yum. Thank you – so nice to hear from you!